The world of stand-up comedy is fertile ground for good stories, if only based on the book (and now Showtime series) I'm Dying Up Here. Any environment as competitive as comedy, that exists mainly late at night and is populated by funny, insecure and desperate people is bound to foster something to talk about. But just because the situation is ripe, doesn't mean it will bear fruit. 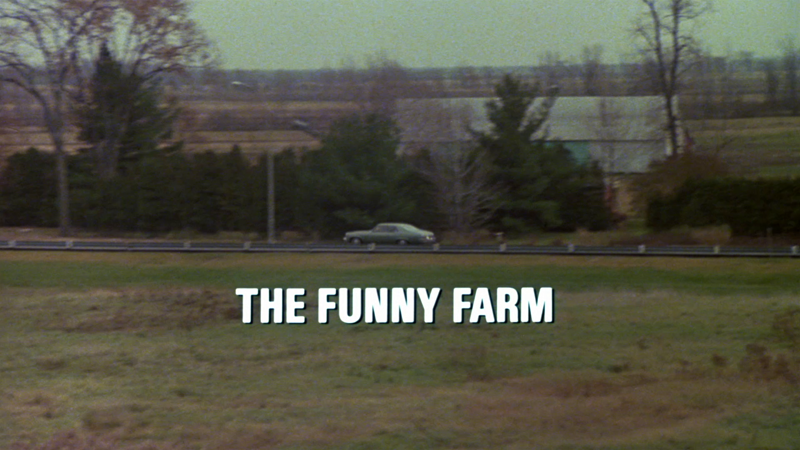 Which brings us to The Funny Farm, a severe misfire of a film, which thought, if we put a bunch of comedians together, a movie will just happen, forgetting that having some semblance of a plot would help. Mark (Miles Chapin) is a wide-eyed comedian making the leap from Ohio to Los Angeles, with a dream of becoming a big-time stand-up. As he drives cross-country, listening to his tapes of Steve Martin and George Carlin, and then explores Los Angeles like the biggest tourist ever, introducing himself to whomever will shake his hand, we quickly realize he's a naive goof and his odds of triumphing in this cutthroat field of entertainment are slim to none. But, since this is a movie, our hero lucks his way up the ladder in a series of increasingly unbelievable successes until he somehow gets a TV pilot, despite easily being the least funny comedian in the film. The thing is, outside of Mark's career goal, there is no plot to the film. 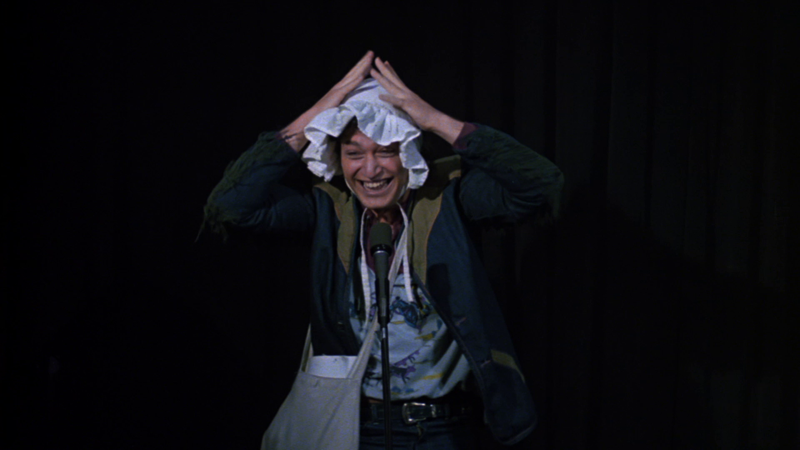 The movie moves from comedy act to comedy act, dropping in off-stage moments where the comedians bust each other's chops and occasionally remembering to check in on Mark's life, which has conveniently moved on to its next stage. At one point, it seemed as if I had nodded off, because I thought I missed something, but rewinding revealed the film just decided to jump forward, perhaps because it too was uninterested in what was going on with these people. It only gets worse when the film attempts to get dark, a tonal switch that even a better film couldn't recover from. Perhaps, if the characters were better developed, or perhaps, you know, developed, these moments would have an impact, but as is, it's just the cinematic equivalent of throwing spaghetti against the wall. At some point however, the pasta party ends, as the film just peters out, having run out of comic bits and having nowhere else to go with Mark. Perhaps the lack of satisfaction delivered by the movie is meant to make the viewer feel Mark's emptiness. But I doubt it. It's unfortunate that the movie is so ill-conceived overall, because there are some funny people involved, starting with Howie Mandel, who is touted as a star, but plays a somewhat limited role. 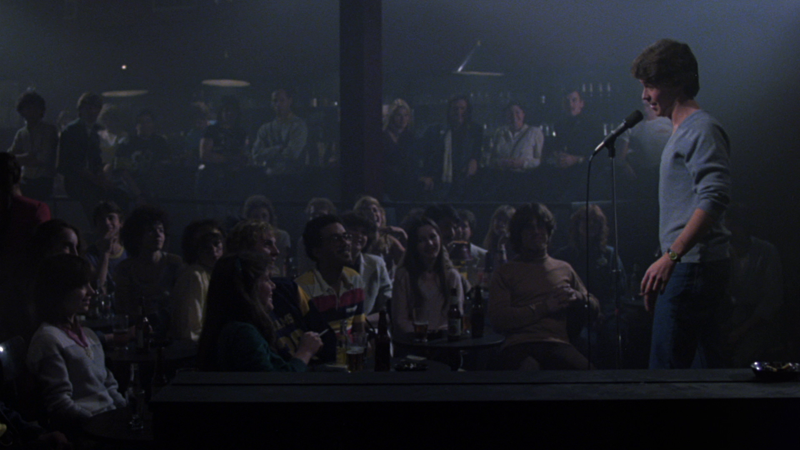 He does do some of his stand-up act though, including his famous Bobby voice, which is always worth watching. Fantastic voiceover artist Maurice LaMarche also gets to spotlight many of his perfect impressions here, while the great Eileen Brennan channels Mitzi Shore as a comedy club manager and Jack Carter is excellent as a veteran Vegas comic, even if his performance doesn't quite fit with the rest of the film. It certainly makes more sense than Steve Allen's brief cameo. Code Red brings home The Funny Farm on one DVD, which is packed in a standard Blu-ray keepcase with some busy, misleading cover art taken from the film's poster. The disc has a static menu with options to watch the film and check out the extras. There are no scene selections, no audio options and no subtitles. The 1.78:1 anamorphic widescreen transfer on this film (advertised as having come from a new HD master of an original interpositive) is pretty nice, delivering attractive color and decent fine detail over most of the film, with a healthy, consistent layer of grain. Black levels are good, but darker scenes (like those inside the comedy club) are excessively noisy in the shadows and exhibit some crush. For an older, low-profile comedy, it's not a bad presentation, with some noticeable dirt here and there and little damage, while digital distractions are not a concern. The only real extra is a new 7:37 interview with the gorgeous Tracey Bregman (who filled the thankless role of Mark's actress gal pal.) Reminiscing about her former cast mates and the experience of making the film in Montreal, she manages to pack a lot of info into a brief sit-down, including the film's connection to the death of John Lennon. Also included is a reel of rather intriguing trailers, including one for this very film (2:02) which tries to sell it as a raunchy, madcap comedy, as well as promos for the Richard Harris-led Highpoint (1:38), Savage Attraction (1:00), the childhood favorite They Call Me Bruce (1:45), They're The Ghetto Warriors (:30) and Acapulco Gold (:50).